“Sophisticated comfort food” á’Bravo opened in 1999 as a small, upscale deli with an emphasis on catering. 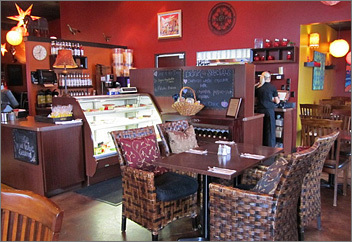 Later they opted to open a larger restaurant with a shabby chic decor and Moroccan flair in the heart of Bellevue. They offer a large variety of breakfast items, sandwiches, salads, pastas and pizzas. Come in and see for yourself what makes á'Bravo so special. The food is very good and the service is excellent. When you are at aBravo it does not seem like you are still in Green Bay (bellevue? whatever) , its like a mini vacation. It was a beautiful day on Monday. And to celebrate the beautiful day, I needed some beautiful cocktails on a beautiful patio. A girlfriend and I bounced over to the Bellevue area to hit up a’Bravo, which is also beautiful. A’Bravo is this upscale bistro and wine bar dichotomy that seems to be perfect for any occasion. Whether you’re in the mood for a Sunday brunch hotspot, a delicious dinner with drinks or some much needed outdoor lounging patio time, a’Bravo is ready. We arrived by 7PM and there were a few tables inside eating dinner and a crowd in the bar area. When you first enter a’Bravo you walk in facing the counter, register and dessert case. The bar area is located to the left, towards the back with some tables for dining sprinkled around. There are also more tables for dining on the right side of the building. To get to their patio you simply walk through the dining area on the right. You can see the patio from the large wall of windows. We opted to relax outside. The inside is really cute, but the last of the rays for the day were calling our names. 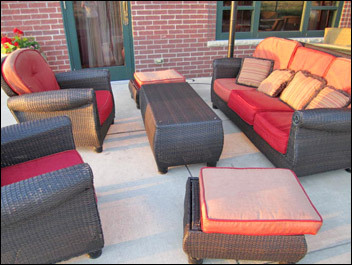 The outdoor patio has more than a few tables with chairs and even some cushy lounge chairs next to a couch. In fact, all their chairs have cushiony tops to them and they’re pretty comfy. The patio is mostly shaded for your convenience and to add to this serene atmosphere are these large over-sized pots with various colorful flowers and other plants. You also have light music floating about tickling your ears. A’Bravo has thought of everything. 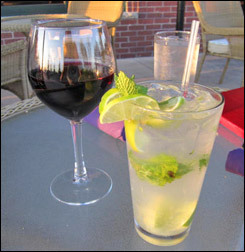 The lovely atmosphere mixed with the warm weather put me in the mood for a Mojito. Lucky for me, that’s one of their drinks featured on their Wine, Martini and Drink Menu. My friend kept it classy with a Pino Noir. Both drinks cost $7. The wines start at $7 and work their way up. Most if the wines can be ordered by glass and all of them can be ordered by the bottle. A’Bravo carries reds, whites and bubblies. For beer they have for domestics Bud Light, Bud, Miller Lite, MGD and Miller 64. The domestics cost $3.50. The imports are $4.25 and include some of the following: Fat Tire, Leinie’s Honey, Corona, Pilsner Urquell, Beck’s Dark, Stella and a few of the New Glarus line. They also have two Hinterland beers: a Pale Ale one and a Seasonal one for $4.75. As for liquor, you can choose a fun cocktail from their menu or get creative and choose your own mix. Our drinks were awesome. Their patio is awesome. And the service is beyond awesome. I’ll be back for some more fun in the sun. 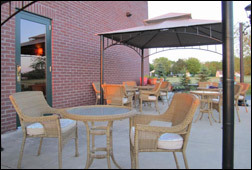 A'Bravo Bistro is a restaurant on the far east side of Green Bay in the Bellevue area. The interior is reminiscent of a Moroccan style cafe. A few of the interior tables are adorned with maroon colored sheer curtains partially open in a tent style with a crystal chandelier hanging above the tented ceiling which made the restaurant look not only unique, but very cozy. Large, ball and star shaped paper lanterns hang from the ceiling giving off a warm glow. On entering there is a small counter with a register and a clear case filled with wonderful looking bakery and pasta items. To the left are tables for dining and a small bar towards the back. To the right of the counter are more tables and a few booths. There also are large picture windows surrounding the restaurant with a dark brown and maroon color theme. Overall the a'Bravo restaurant is decorated in an upscale manner and very clean looking. As soon as I entered I was greeted in a friendly manner by the server and was brought to a booth with a menu to peruse. I was then brought out ice water in a clear glass and was told of the specials and soups of the day. 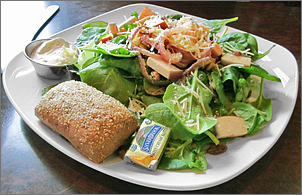 I decided to order their Rustic Lovers Salad for $11.95 and a hot blueberry rooibos tea for $2.50. The tea came in an insulated red ceramic tea pot with a strainer inside containing the loose leaf tea which was infusing in the hot water of the tea pot. The tea also served with a mug and a plate with a lemon wedge and a packet of honey. My tea was hot with a very deliciously smooth and light flavor. The salad was then brought out. It was a large portion and comprised of a mound of piled high spinach and romaine lettuce and layered on top was roasted pistachio nuts, sautéed red onions, sautéed diced bacon, diced smoked turkey breast cutlets, dried craisins and sprinkled on top with fresh parmesan cheese. Served with the salad was a caraway rye dinner roll with a pat of butter. I really liked the salty, smoky, and sweet combination and the ingredients balanced out nicely. The oil from the sautéed bacon and onions was enough that I had to use very little of my parmesan ranch dressing which I had ordered on the side. The rye dinner roll was very fresh and soft inside while the exterior was slightly crusty. The service was very attentive throughout lunch and I was brought more refills of ice water and hot water for the tea. In addition to lunch a'Bravo also serves breakfast and dinner.